A couple of months ago, in another “Design This” post, I mentioned that my customer also had a bracelet project for herself in mind after I finished with her daughter’s jade and pearl necklace. During our discussions about the necklace, a few directions emerged for the custom bracelet order. 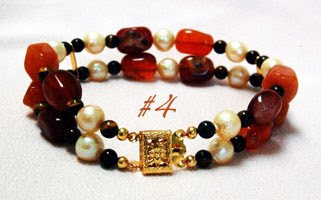 My customer liked the tigers’ eye beads that she had seen, wanted to use some of her leftover pearls, liked carnelian and wanted the bracelet to be double stranded with an ornate clasp and gold plated findings. Custom work is really gratifying when my customers are so thrilled with their orders. I also have to admit that this was the first custom piece that I was sorry that I hadn’t designed for myself, so I’m glad it was well received. Contact me if you are interested in discussing a custom design project. Ok, so I wasn’t actually “out and about” when I sighted these items from two great Etsy artists. Their items are actually hanging on my Christmas tree. My family always wonders how I am going to find places on my tree each year for all of my ornaments, and I must admit that I pass up many more than I buy now because I’m starting to see their point. These two were just too adorable to pass up and I wanted to share how wonderful they look on my tree. 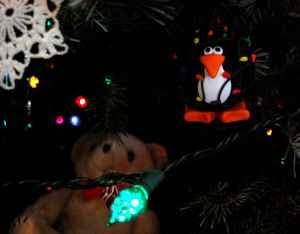 I giggle every time I look at the penguin tangled up in Christmas lights. DivaDea has a whole line of endearing penguins. She makes penguins that represent many different holidays, occassions and vocations. You will also find wonderful polymer clay beads, jewelry, home décor and more at DivaDea’s shop on Etsy. This past summer ItsMeCheri created a cute collection of Lil HeartBirds. 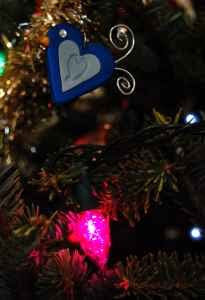 The blue one reminded me of a bluebird of happiness that needed to fly over and perch on my Christmas tree. ItsMeCheri is another very talented polymer clay artist with a shop on Etsy. I hope you and yours are enjoying this holiday season and I wish you the best for the new year. If a killing freeze has turned sections of your garden from vibrant to drab, you need to do a little “winter cleaning” for the look and health of your garden. 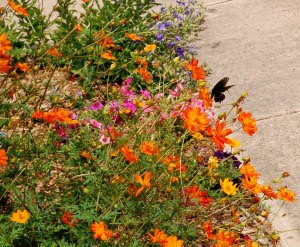 Annuals that have turned brown need to be taken out and perennials that go dormant over the winter need to be clipped back. Not only will this maintenance make your garden look better, but it can improve the health of your garden by removing hiding places for pests to spend the winter in. This is especially true for beds of asparagus. 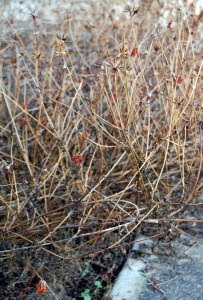 After pulling out the dead annuals and clipping back the dormant perennials, you may discover some winter weeds that need to be pulled. Once you have completed these tasks, it is a great time to freshen your mulch. It is easiest to do now, when there are no plants to mulch around. If you are in a part of the country with mild winters, you may even want to put in some pansies or snapdragons. The photos accompanying this article are of a portion of one of my front beds. Annual cosmos predominates in shades of yellow and orange during the summer, right up to the first freeze. After the freeze, the now brown plants were taken out and the ripened seeds scattered back into the garden for next year. 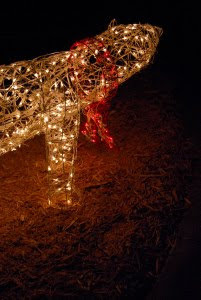 I added a layer of no float cypress mulch before putting out my polar bear holiday decoration. I will put in some cold hardy annuals along the edge of the walk after the holidays. On November 24, 2009, I lost my mom to cancer. My friends in high school never really understood when I said she was my best friend. (Parents weren’t supposed to be your best friend at that point in your life.) She was always there to listen if I had a problem, needed to bounce an idea off someone or just talk. She was also very supportive and interested in the various projects I have undertaken in my life, from work to volunteering to hobbies. She often likened me to Johnny Appleseed with the way her garden and many others bloomed with plants that I divided and shared from my own gardens. A few years ago, my husband gave me an amber pin/pendant that I wanted to be able to wear both as a pin and as a pendant on a beaded necklace. My mom helped me look for beads that would compliment the piece and I found a bail that allowed me to remove the pendant without disturbing the rest of the necklace. After we had gathered a good variety of beads, she helped put together the design and walked me through stringing up the necklace. After that, she encouraged me to try my hand at designing a couple of pieces to put in her booth at an antique/craft mall. 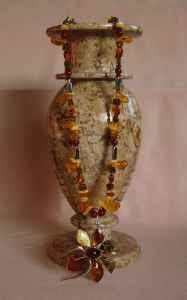 A necklace and earring set of mine sold and I was hooked. Unfortunately, this was also about the time that the economy went south. My mom closed up her space and I discovered Etsy. We decided to open a shop on Etsy together and EDCCollective was created in February of 2009. My mom always enjoyed collecting and had been the proprietor of different shops over her lifetime, so she had a great store of vintage collectibles to contribute, as well as some of her own jewelry designs. My first listing was actually a pair of cute coyote vintage earrings, but I quickly added listings for my handcrafted jewelry items as well as photographic art. My mom listed a variety of her vintage treasures as well as a couple of her handmade pieces. Later, I expanded my offerings to include note cards and bookmarks based on my photographic art as well as some hand crafted wood items. We worked hard to get our little shop noticed. Sales began to trickle in. October was shaping up to be our best month yet when my mom began experiencing health problems. Towards the end of the month she was diagnosed with a very aggressive late stage cancer. Still, she managed to keep her spirits remarkably high and continued to put her efforts into building our shop. On November 11, she mentioned how pretty the front page of our shop looked. I decided to capture this with several screen shots, not knowing then what I would do with the resulting image. Now I do. I would like to end this post with the view of our shop that my mom liked so much, as a memorial to her. (Click on the image to enlarge it.) Her journey was much too short in the eyes of the people that knew and loved her, but I am very grateful that she was my friend in high school and beyond. She is very much missed but I know will never be forgotten.